Welcome to the Davis Mergers & Acquisitions Group, the Graybeards! We know the alarm and integration businesses, and the people in them, better than anyone. Our business is to help you get the greatest rewards possible when it's time to sell your company. 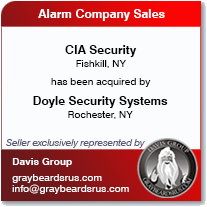 Click link here for an up-to-date list of successful Alarm and Integration company sales that started with a call to the Graybeards.